With just a small bit of ingenuity, turn everyday food into something cute using Kaori’s recipe series! 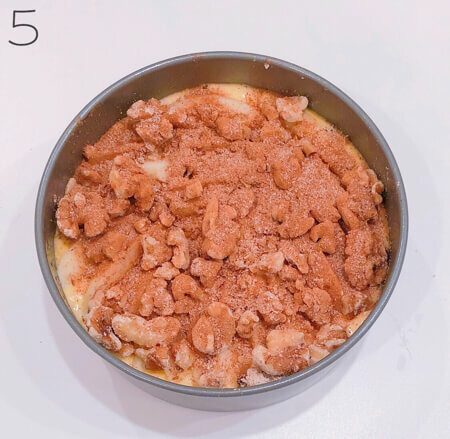 With a few simple ideas, an ordinary recipe magically transforms into a cute dish. 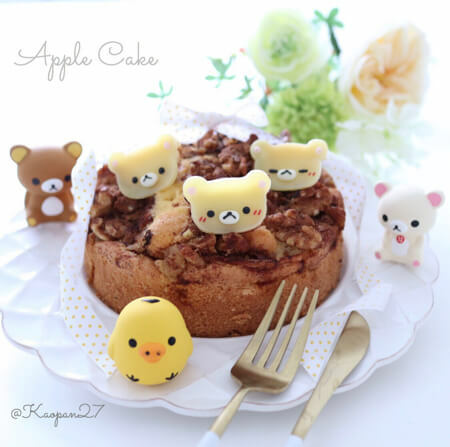 This time you’ll learn a simple recipe to make a gorgeous Korilakkuma apple cake that even novice cooks can follow! ・Thinly slice the apples and squeeze over lemon juice. 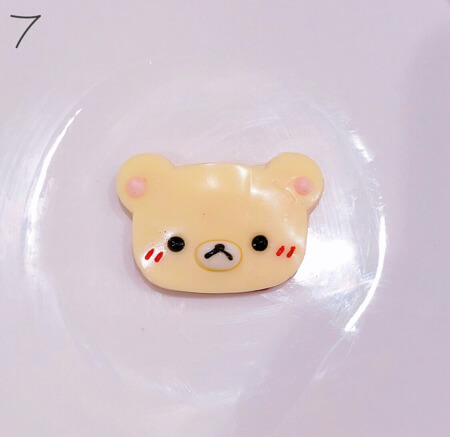 Cut 2-3 to the slices into a Korilakkuma shape. ・Roughly chop up the walnuts. ・If you don’t have cinnamon sugar, mix together one tsp of cinnamon with 1/4 cup of sugar. 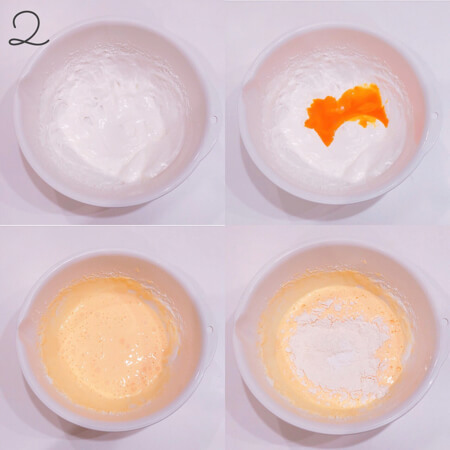 ・Combine the weak flour and baking powder and sieve. Melt the butter over a bain-marie. 2: Separate the egg yolks and whites. Thoroughly whisk the egg whites. Combine with the egg yolks, add the flour and mix. 3: Stir the mix in step 2 well. Add the melted butter in the places where it looks like there’s some flour left and mix. 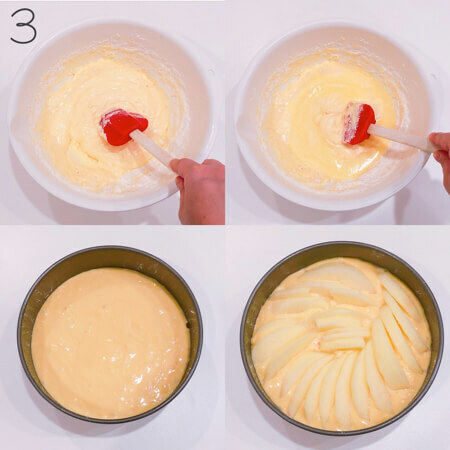 Add the mix to your cake tin and add your sliced apples that you prepared (but not the Rilakkuma shaped pieces). 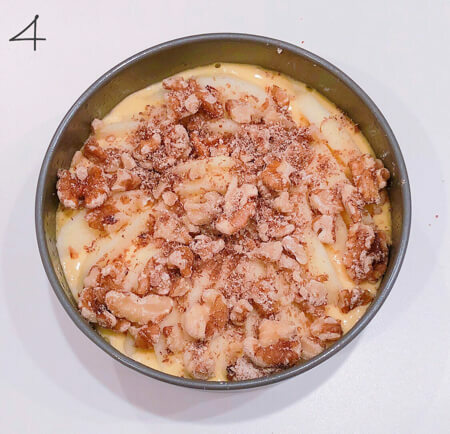 4: Place the walnuts all over the mix. 5: Sprinkle over cinnamon sugar. 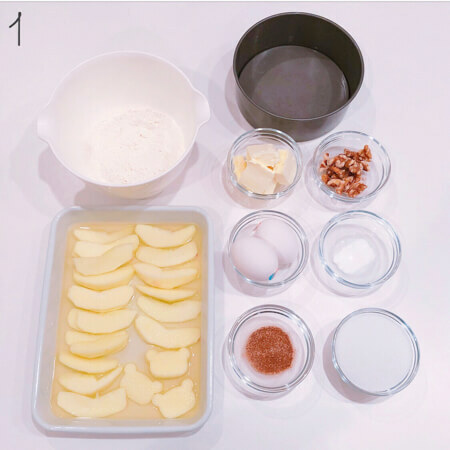 Cook in a preheated oven at 170℃ for 20-25 minutes, then add the Korilakkuma apple slices and cook for a further 5-10 minutes. 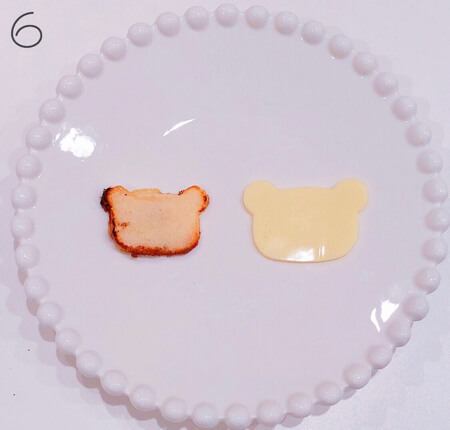 6: If you cut a good shape of Korilakkuma out with your apple then leave it as it is. 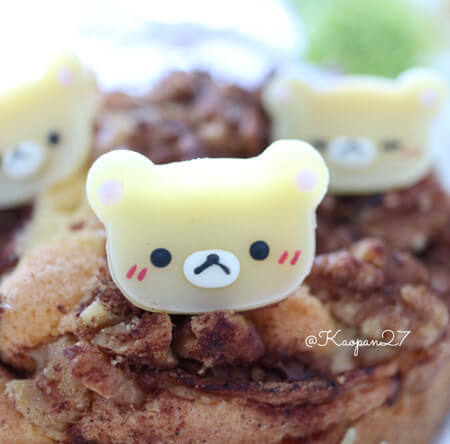 If the shape didn’t turn out well, cut out a white chocolate Korilakkuma and place it over the apple. 7: Draw the facial features with a chocolate pen. 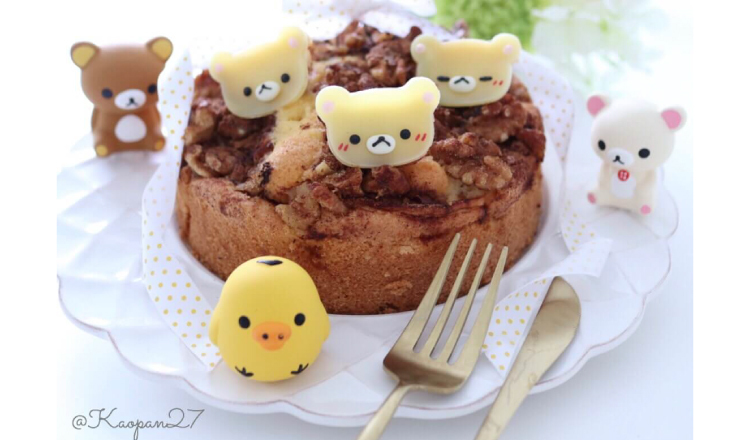 Once the apple cake is done, decorate all of your Rilakkuma, and you’re done. 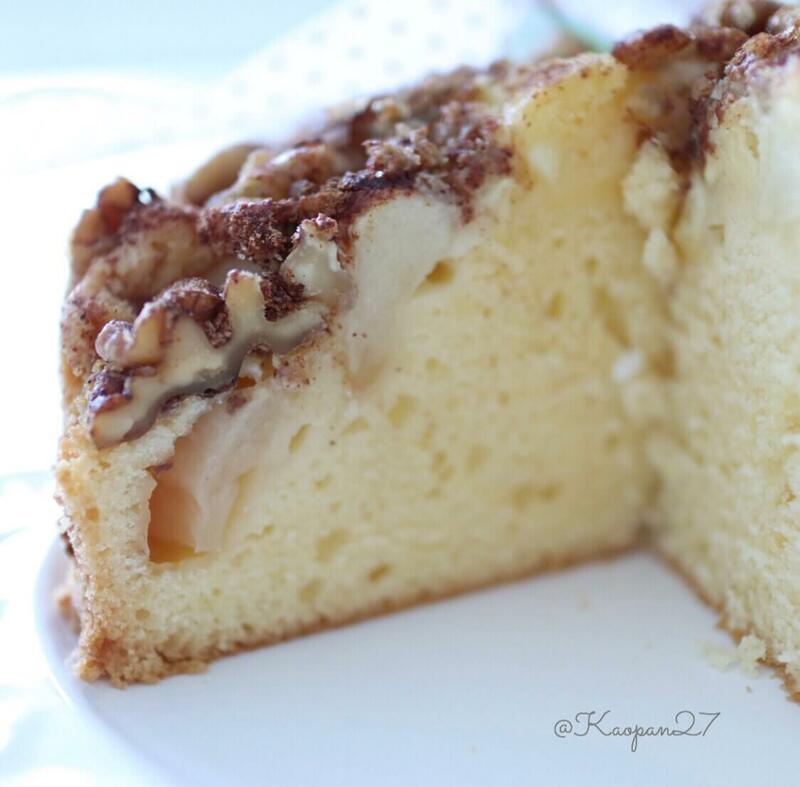 The moist cake goes together perfectly with the apple, walnuts and cinnamon sugar! It’s delicious eaten fresh, but its level of moistness increases if you eat it the next day. Kaori invites you into her world of character-themed food dishes in her recipe series! Please check out her Instagram where she has uploaded many pictures of her character dishes! I live in Hokkaido and I love to make character-shaped meals, desserts and breads. I enjoy making character foods because I want to see my family smiling. Rilakkuma Ice Cream Maker―Create Cute and Delicious Ice Cream From Home! Springy-textured fried sweet treat Rilakkuma-yaki makes a comeback with new packaging design!